It was my great privilege to have been invited to participate in the 2016 Pace International Law Review Symposium: Cuba and Iran: A Look at Global Trade and Development. Special thanks to Professor Darren Rosenblum, Pace Law School's Executive Director of Commercial and Private International Law Programs and the Faculty Director of the Institute for International and Commercial Law. 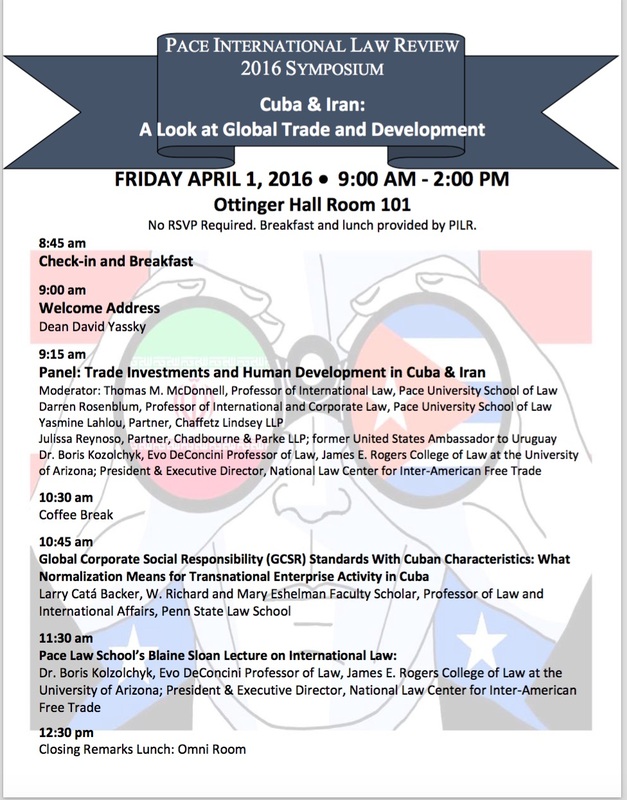 The Program was highlighted by the 2016 Blaine Sloan Lecture on International Law, Cuba & Iran: A Look at Global Trade and Development, which was presented by Dr. Boris Kozolchyk, President & Executive Director, National Law Center for Inter-American Free Trade and Evo DeConcini Professor of Law at the James E. Rogers College of Law at the University of Arizona.